NASA’s Space Shuttle Trainer, now on display at the Museum of Flight in Seattle. I’ve had a lifelong fascination with space exploration. I grew up on Tang, had an Apollo 11 lunchbox and watched NASA moon missions from my elementary school class room. 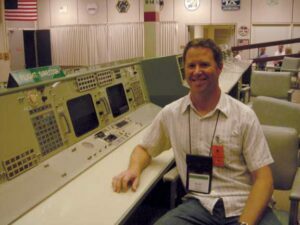 A couple of years ago, I had a rare chance to go inside the original Mission Control at the Johnson Space Center in Houston. I had my picture taken in the flight director’s chair and – boom – I was seven years old again. Now, grown-up space geeks like me have good reason to celebrate right here in Seattle. 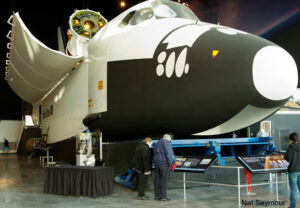 Earlier this month, the Museum of Flight welcomed a NASA Space Shuttle Full Fuselage Trainer. This full-size mock-up was used by all 355 shuttle astronauts to prepare for missions during the 30-year shuttle program. 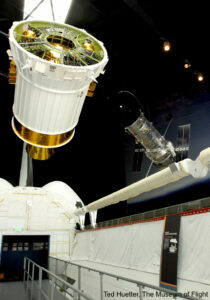 The cargo bay with IUS and Hubble 2. It’s a “wow” at first glimpse, rising four stories and spanning more than 100 feet. You can tour the payload bay section of the trainer with your regular museum admission, or reserve a one-hour tour of the crew compartment. The Space Shuttle Trainer is the permanent centerpiece of the museum’s new 15,500-square-foot Charles Simonyi Space Gallery, which tells the story of human space flight primarily from the beginning of the space shuttle program. However, just as in outer space, this new gallery space is shared with the Russians. Check out the Soyuz TMA-14 spacecraft which launched into orbit in 2009 on a mission to the International Space Station. Fun fact: on board that mission was Dr. Charles Simonyi, “space tourist” and, now, namesake for this new gallery. Mission Control in Houston, living the dream. By the way, don’t miss the museum’s pre-existing, but equally cool, Space: Exploring the New Frontier. This exhibit has detailed 1/6 scale models of the lunar module Challenger and the lunar rover, plus a diorama of the Apollo 17 landing site and scale versions of astronauts Gene Cernan and Jack Schmitt. Each time I leave the Museum of Flight, my gait is more deliberate and my foot is heavier on the accelerator. We won’t all grow up to be astronauts. And widely available space tourism may be years away. But, we can keep dreaming, can’t we?